• International road Belgrade-Zagreb E70 - 80 km far away form Loznica. • Corridor 10 is also 80 km far away from Loznica. 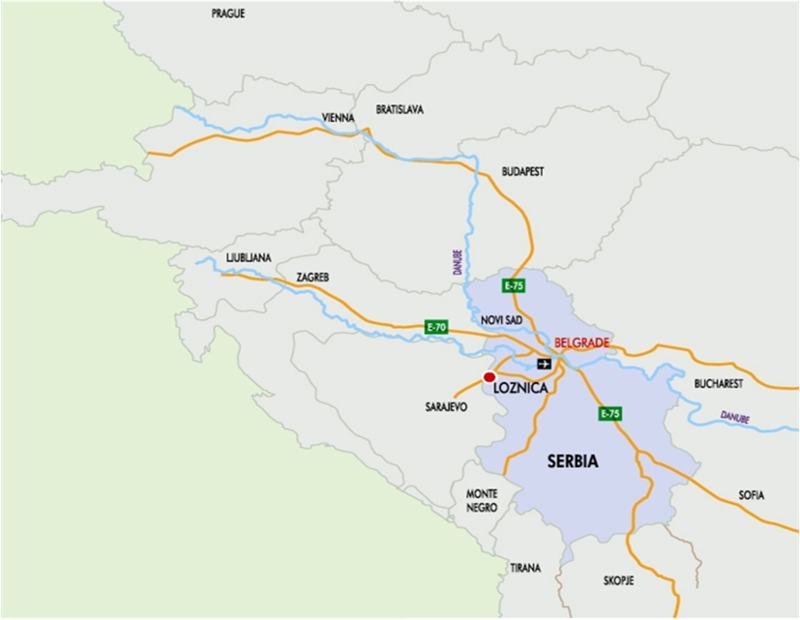 • M-19 connecting town with Belgrade and Bosnia and Herzegovina and highway E70. • M-4 connects the town with the south of Serbia. 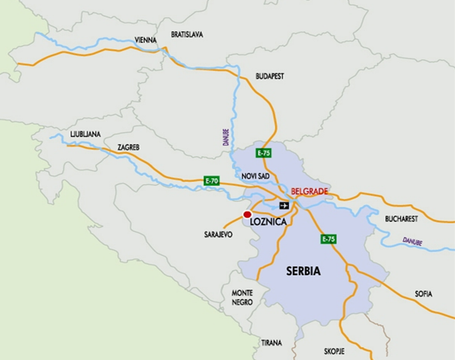 • Distance to airport: 110 km to Belgrade and 130 km to Sarajevo. Three distinct areas are noticeable in the Loznica relief, Cer with Iverak to the north, in the middle Jadar basin with alluvial valley of the river Drina and the mountain range of Gucevo to the south. Situated between the mountains of Cer and Iverak, on the north and northeast, mountain of Vlasic on east, Gucevo and Kostajnik and branches of Boranja, on the south, opened toward west and northwest, topography of Loznica city territory reminds of huge amphitheatre-giant horseshoe. Sheltered by the mountains and their branches from cold north and eastern winds, Loznica with its vicinity, forms special oasis of regional climate, by which it significantly differs from climates of the neighbouring regions. Namely, the summers in Loznica are somewhat colder and winters warmers than in neighbouring cities. Opened towards west and northwest and thus exposed to primarily humid air currents, the city of Loznica has somewhat larger amounts of rainfall in comparison to neighbouring territories. That is why its flora is more exuberant, the water currents are larger and more stable, and water springs are more numerous and powerful. . The average annual temperature of the air in Loznica is 110C C, the actual lasting of the sunshine (effective insolation ) on average annual level amounts to 2.041 hrs, the precipitation annual average level is 800-1000 mm , wind frequency is relatively low - 282%o. Taken into consideration the previously mentioned indicators it can be said that climate of Loznica and its vicinity is very favourable. In terms of water resources the City of Loznica is certainly among he best in Serbia. Its water resources are significant and versatile. It is made of surface water currents -rivers, underground waters and thermal mineral springs. The most important are: Drina, Jadar, Lesnica, Stira I Zeravija. Territory of the Loznica town is rich in large reserves of underground waters. The waters are of good qulity and present the most important source of water supply for the population and industry of Loznica and general town settlements. 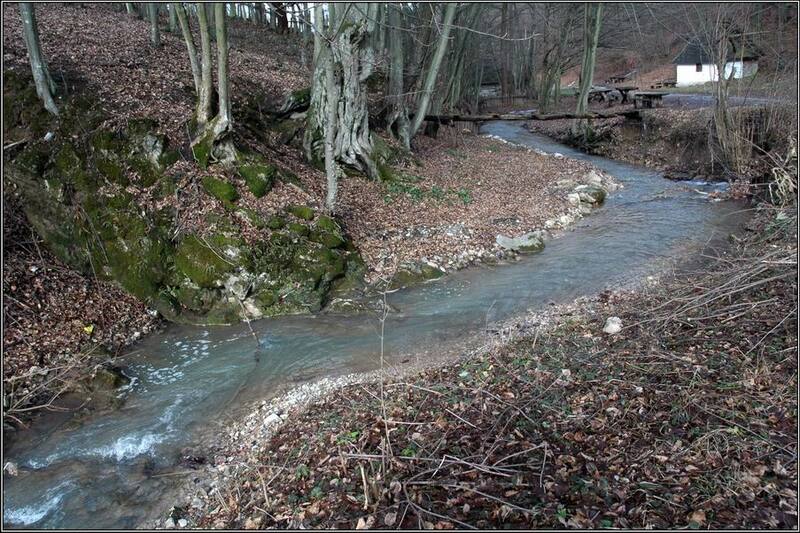 The strongest springs in the Loznica municipality are linked to fissures through which waters from higher debts, with spacious feeding areas break into surface. The strongest among them is such a spring near monastery Tronosa , with maximum yield of 5,5 l ./ s. It is capped into drinking fountain "Devet Jugovica" with ten "pipes" from which strong jets of crystal clean cold water gush. The spring is real jewel and specific natural-historic monument. Springs of thermal-mineral waters add to the rich water resources and its variety in the Loznica municipality. The occurrence of springs is linked to numerous fissure lines, as well as to the earlier volcano activities. The most important are the waters of Banja Koviljaca which come out in several springs; according to content of the dissolved chemical elements they are classified as alkaline muriatic, ferriferous and sulphurous. The most recent researches show that the Banja Koviljaca waters are HCO3, ClNa, Ca, Mg type, overall mineralization 1,41 g/l, temperature around 30ºС and hardness (pH) 6,6. Бања Бадања is situated on the south slope of Iverak , in the area of the village of Donja Badanja, in the valley of the river Cernica. 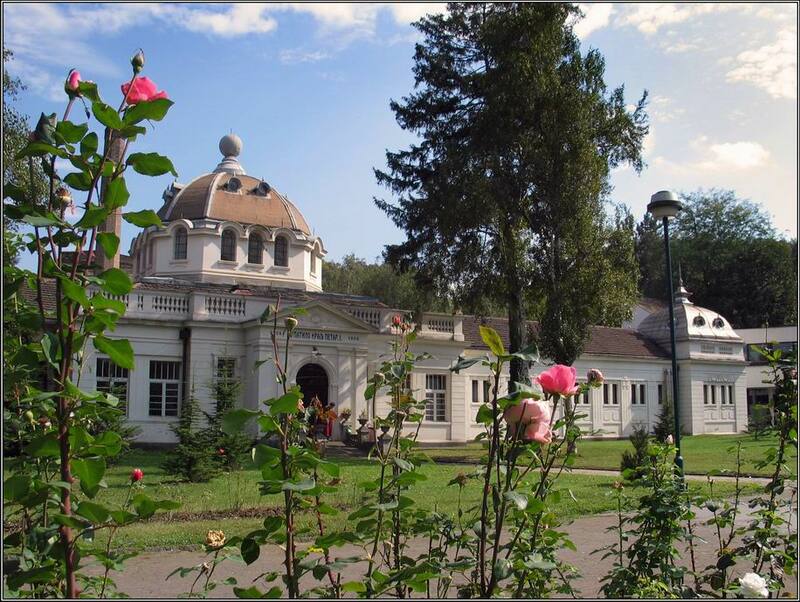 There are two springs in the spa: „Main spring" of sulphurous water and spring „Iron waters". Water temperature is in the range 15 - 18ºС, total mineralization 0,8 g/l, hardness 7,0, with significantly increased radioactivity. The most important plant species are : white willow, ashen willow, poplar, black alder, European ash, oak , white hornbeam, black hornbeam, black European ash, beech, locust tree, etc. Species of herbaceous plants are also present: various grasses, meadow plants (especially herbs, such as Klamath weed, centaury, yarrow, thyme, etc. and other ) as well as numerous kinds of eatable mushrooms and agricultural cultures. The rivers in the Loznica region fall among clear current waters. The waters of streams and small rivers that flow into the rivers of Lesnica and Jadar are particularly clean the river Drina is also very quick and clean. For this reason this territory is considered well preserved in terms of varieties of fish species. Following kinds of fish can be caught in these rivers: catfish, hutchen, nose-carp, trout, carp, chub, barbell, grayling, pike, perch, etc. Mammal species characteristic of other terrains of Serbia in hillside mountain range can be found within the Loznica municipality region. The most important for hunting are: rabbits, fox, dormouse, wolf, roe deer, wild board, etc. There are no endemic species within the city territory. Over fifty species of birds flow over the river Drina and its reservoirs or stay shortly in its vicinity. Following species are relevant for hunting-grey partridge, chukar partridge, quail, mallard and pheasant.